On this date in 1622, or very close to it, the Patuxet Native American Tisquantum (better known as Squanto) was about to be yielded by Plymouth Colony Governor William Bradford to Wampanoag chief Massasoit for immediate execution … when the unannounced appearance of a strange ship fortuitously saved him. Squanto is most famous as the Indian godsend who saved the Mayflower Pilgrims at the Plymouth Bay colony from starvation by teaching those pious wayfarers how to live off the land in the New World. In that capacity, he made possible (and participated in) the “First Thanksgiving” harvest gorger in 1621 that figures as the antecedent of the modern American holiday. Our day’s principal has therefore been portrayed on the stage by generations of schoolchildren from Cape Cod Bay to California. But this was only the tail end of one of the most remarkable lives in history. Photo of Tisquantum bust by N. Ayad of Cupids Cove Chatter. Photo was taken courtesy of the Pilgrim Hall Museum, Plymouth, MA, United States. As a youth, Squanto was kidnapped from his native soil by English explorer George Weymouth, who sold him into slavery in Europe. Squanto wound up in London in some sort of forced-labor capacity, before hitching a ride back to the Americas with Captain John Smith — the Pocahontas guy. This is the author of Squanto And The Miracle Of Thanksgiving. However, because Squanto was a real person and not a Disney character, he began exploiting his privileged intermediary position for his own advantage. 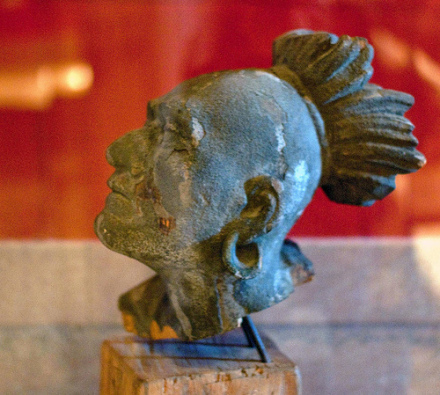 Squanto sought his own ends and played his own game, by putting the Indians in fear and drawing gifts from them to enrich himself, making them believe he could stir up war against whom he would, and make peace for whom he would. Yea, he made them believe they kept the plague buried in the ground, and could send it amongst whom they would, which did much terrify the Indians and made them depend more on him, and seek more to him, than to Massasoit. Which procured him envy and had like to have cost him his life; for after the discovery of his practices, Massasoit sought it both privately and openly, which caused him to stick close to the English, and never durst go from them till he died. Seeking Squanto’s life both privately and openly, Massasoit sent messengers to the Plymouth colony requesting the Machiavellian diplomat’s return in accordance with the colony’s treaty arrangements with the Wampanoag. Bradford ducked and dilated, not wanting to give up this valuable asset, but the precarious colony also needed the amity of its Indian neighbors. Bradford was on the point of yielding to this demand when a strange boat appeared unannounced — and the guv hit the “pause” button on everything. he would first know what boat that was ere he would deliver him into their custody (not knowing whether there was a combination of French and Indians). Mad with rage and impatient at delay the messengers departed in great heat. The delay turned out to be permanent … which for Squanto was only a few more months before he caught ill† and died later in 1622. The ship that quite unknowingly bought Squanto this extra purchase on life had nothing at all to do with the drama unfolding between Bradford and Massasoit: it was the Sparrow, the advance party of the coming Wessagusset (or Weymouth) colony which would plant itself adjacent to the Plymouth settlers and completely crash and burn. And the Pilgrims and the Indians lived happily ever after. * This site asserts May 31 was the date that the Sparrow came ashore at Plymouth. Most sites are slightly less specific, noting only that the ship arrived in very late May. ** Among Squanto’s good deeds for the fledgling colony was tracking down a boy who got lost in the wilderness. The boy was John Billington, the eponymous son of the first man hanged in the Plymouth Colony. † Some suspect that Squanto’s “illness” wasn’t so accidental, and the frustrated Wampanoag chief simply dispensed with the diplomatic rigmarole and poisoned him off.